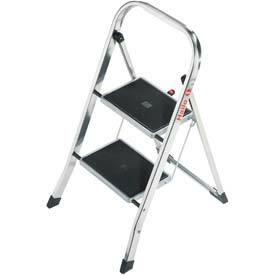 HAILO FOLDING LADDER K30 2 STEPS: Just stick the folding steps under your arm and take them with you whenever you have to clean the shelves in the cellar. Or tidy up the utility room. Or even change the bulb in the garage. This little chap with the large steel steps weighs just 3.3 kg. You can carry that, no problem! What‘s more, the elegant aluminium design cuts a fine figure wherever it goes. And because it can be folded down flat, stowing it away when the job is done is child‘s play too!